An estimated 1 million public sector workers that includes most teachers have gone on strike today to protest against the sub-inflation 1% pay cap and for some even ZERO pay increases of the past few years that the Labour union movement has labeled as the 'cost of living crisis' as inflation each year erodes the purchasing power of earnings. The effects of the strike are that most schools across England and Wales are closed for the day which whilst seen by children as great for a warm and sunny July day spent out of school, but not so great for millions of parents who are once more left to pick up the pieces of an increasingly dysfunctional and rebellious public sector that is being stoked up into fever pitch by union leaders ahead of the May 2015 General Election. Therefore the people of Britain can look forward to many more days of strike chaos as a consequence of wide spread industrial action. 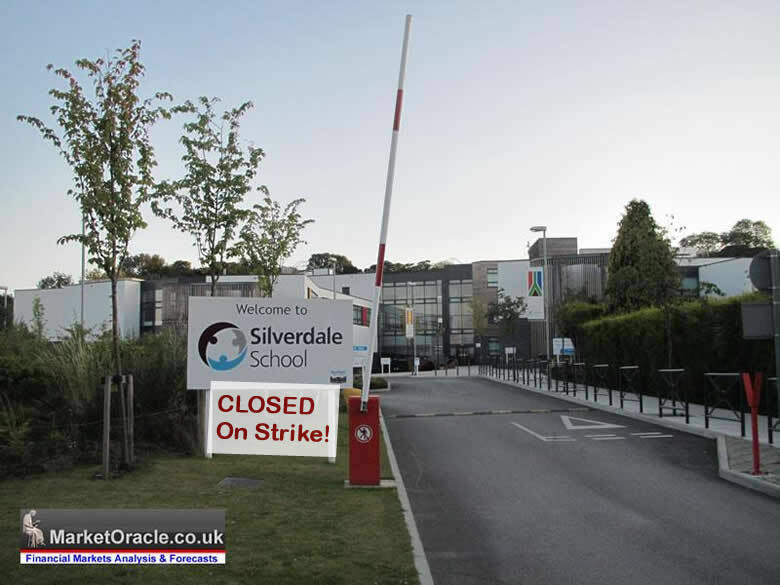 As an example in the city of Sheffield approx half of the schools are closed with most of the remaining such as Silverdale Secondary School only partially open with parents notified by text messages just the day before of the closure as the teachers can today be found parading outside Sheffield Town Hall with banners such as Can't Teach, Won't Teach. However the reality of the situation is one of the Coalition government still wrestling with the last Labour governments legacy of out of control public sector spending (vested interest bribes) of funneling cash into an unproductive public sector that does not match the reality of the real world in terms of pay rates and conditions of private sector workers and are even further removed from that which is experienced by the many millions of workers on zero hour contracts. Therefore instead of striking public sector workers should be showing their gratitude for continuing to enjoy riding on the public sector gravy train as the consequences of the unproductive public sector continues to manifests itself in an unsustainable annual budge deficit of over £120 billion that actually CAUSES the inflation that the public sector workers are today demonstrating about. The following graph for UK public sector net debt clearly shows that the UK government has hit a deficit cutting road block because instead of the deficit falling to around £60 billion for 2013-14, the government will be luckily if the deficit comes in at under £110 billion. Furthermore the trend for persistently high deficits is expected to continue all the way into the May 2015 general election as the Coalition government further ramps up deficit spending to buy votes, therefore there is a high probability that the deficit could yet expand further, the net effect of which would be for a total additional debt of over £130 billion beyond the governments expectations to be added to Britain's debt mountain. The graph clearly illustrates that the deficit is not only NOT going to be cut but will expand in the run up the next general election which will put Britain in its most indebted state yet, this despite a strong economic recovery. The only answer / solution that governments have remains as I have iterated many times over the years, that of stealth default by means of high real inflation, and hence the Inflation Mega-trend. Inflation is a REQUIREMENT for the Debt Based Economy, this is how governments keep putting off the day of reckoning by attempting to inflate the debt away with printed money and then borrowing more money to service the debt interest which is why virtually all money in an economy is debt money that will NEVER be repaid. When George Osbourne and David Cameron are stating that they are paying down Britain's debt, they are LYING! The same goes for Ed Milliband if he states that he will cut Britain's debt. NO GOVERNMENT DEBT IS BEING REPAID OR WILL EVER BE REPAID! Instead the truth is that the WHOLE of the economic growth (in real terms) since the May 2010 General Election and continuing into the May 2015 General Election will be wholly as a consequence of some £550 billion of additional DEBT. Again this is a very important point to note that ALL of the economic growth of this parliament is DEBT based, ALL of it, including the soon to follow boom into May 2015, the debt accrued over the 5 year term will equate to total real terms increase in GDP - virtually pound per pound. You should have realised by now that the constant drivel about the threats and risks of debt deflation are nothing more than propaganda so as to allow policies such as quantitative easing (money printing) to be more palatable to the general population so as to ensure that the Inflation Mega-trend continues, therefore a good 90% of what you read in the mainstream press which is regurgitated by the blogosfear is pure propaganda motivated drivel, there has not been nor will be debt deflation. This is where we leave behind academic analysis of UK debt that the mainstream financial press and which government propaganda / politicians focus upon, but instead take a look at what is really going on with regards Britain's debt dynamics, because the picture we get is very different to the one I have just extensively painted above when we bring what I termed as the Quantum of Quantitative easing into the picture ( 20 Jul 2012 - The Quantum of Quantitative Easing Inflation is Coming! ). What is the Quantum of Quantitative Easing (QQE) ? First a reminder of QE, to date the Bank of England has officially printed QE of £375 billion, plus another £100 billion that goes by the name of funding for lending, plus at least another £75 billion of behind the scenes off balance sheets loans to the Bankrupt banks that date back to as long ago as April 2008 that are continuously rolled over which means that the total QE is at least £550 billion of which approx 75% is being utilised to to buy UK government bonds. 20 Jul 2012 - The Quantum of Quantitative Easing Inflation is Coming! QQE is taking place by means of the interest earned on government debt bought by the Bank of England i.e. the Bank of England prints money to buy government debt from the banks, therefore the government pays the Bank of England interest on this debt most of which then gets recycled back to the Government so in effect the government has free money to spend that it should not have, and the more bonds the Bank of England buys the less net interest the Government has to pay. Imagine if all of the bonds were owned by the Bank of England, this would mean that the net interest paid by the government on all of its £1.1 trillion debt would be virtually ZERO! So effectively the government has NO DEBT TO SERVICE, because without any interest to pay it effectively ceases to exist! Yes this mechanism is QQE because it allows the government to spend money without increasing its NET debt burden, not only that but the government is actually REDUCING its debt burden as the debt is actually being cancelled out. So QQE is the quantum of QE as the net debt interest burden falls towards ZERO. I am sure this is one secret that the Bank of England wants to keep hidden away for as long as possible for it implies that the ramping up of the Inflation Mega-trend is already underway with approx 1/3rd of Government debt having been effectively cancelled to date! The policy of QQE has subsequently been seen to be made manifest as illustrated by a series of announcements that the Bank of England has in total transferred about £70 billion in interest received form the government back to the UK Treasury, which is then used as income to finance further government spending. The long term consequences of this is to neutralise the impact of future interest rate rises that academic economists obsess over.